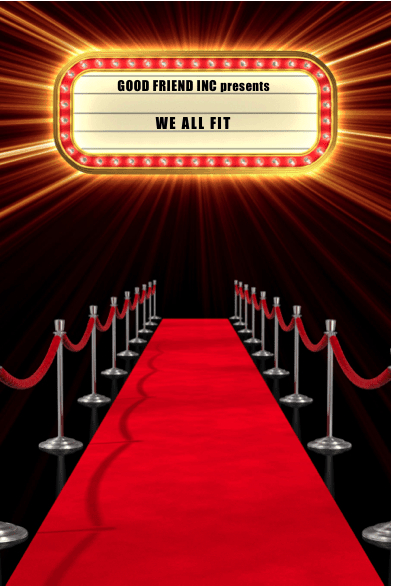 We look forward to seeing you at the Red Carpet Premiere Party of our newest autism peer sensitivity film, We ALL Fit! But your admission to the May 28 event requires a ticket, and you can’t get a ticket unless you register online here. Have the names of your guests ready to enter in the form. If you want all the tickets for your party mailed to a single address, there’s no need to complete the address information for other guests. Tickets will be mailed May 19. Doors open at 6:15, and the program begins at 6:30 p.m. This hour-long event hosted at Marcus Majestic is intended for those age 4 and up. Formal attire is welcome, but not required. Popcorn and soft drinks will be served, thanks to the generosity of our sponsors: AutoZone, Wisconsin Vein Center, The Ability Center, and Ford Construction Co.
Email chelsea@dev.goodfriendinc.com if you have any questions.